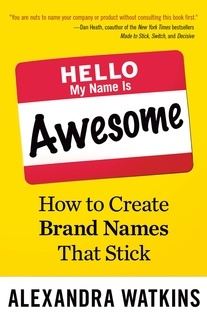 Okay, wow, I STRONGLY recommend this book for anyone who is naming a business or product. Like, don't expect to have a name in two days, do the work to figure out a good name, and yes, this book will help. I wish I had a product or company to name at this point, because this book is the way I'd find the name. Watkins comments early in the book that her colleagues were concerned about her giving away her naming secrets by writing and publishing this book. Her response was something to the tune of, "Nah, I'll be fine, people don't want to do the work of finding the best name, I'm good," Which is totally believe. Watkins gives step-by-step instructions on finding options and choosing them. For the record: I have fully sucked in naming my projects, by a lot. I now know it. I originally borrowed this book from the library, but appreciated the content enough to go buy a copy from the book. I strongly recommend you do the same if you're naming a product. If you're not naming a product (or company), keep this on the back burner for when you do. You won't regret it. clever ad headlines get noticed , get buzz , and get sales because they make strong emotional connections with consumers . Suggestive — Evokes Something about Your Brand A name can’t be expected to say everything , but it should suggest something about your brand . These names , also known as portmanteaus , work well because they cleverly marry two words together , are intuitive to spell , and easy to pronounce . Resonates with Your Audience It’s important to make sure your name is meaningful to potential customers , not just to you . Most of the time when people encounter your name , you won’t be there to explain it to them . Do Not Name Your Company after yourself While it may evoke warm thoughts to your friends and family , your personal name is meaningless to your future customers . Legs — Lends Itself to a Theme for Extended Mileage To get the most out of your name , give it one that has legs . Strive for a theme with mileage you can build your brand around . Names with legs provide endless wordplay and verbal branding opportunities . If you have a catchy name that makes people smile , you can slap it on merchandise that people will pay for because they love your name and want to show it off . Emotional — Moves People A recent Fast Company article revealed that 50 percent of every buying decision is driven by emotion . SCRATCH is an acronym for the seven deal breakers . A good way to remember this : if it makes you scratch your head , scratch it off the list . Spelling Challenged — Not Spelled like It Sounds If you have to spell your name out loud for people , Siri butchers it , or it looks like a typo , it’s a mistake . Don’t Get Cute with Numbers While it may work for texting and clever license plates , embedding numbers in a brand name looks cutesy and unprofessional . Test the Siri Theory The true test to see if a name is spelling challenged is to see and hear how voice recognition software spells it . Copycat — Similar to a Competitor Hijacking another company’s original idea isn’t good for your business reputation or for building trust with your customers . name from a customer’s point of view , you can avoid causing frustration if your name does not appear forced , random , or grammatically incorrect . Clunky Coined Names If you invent a new word for your name , be careful that it doesn’t sound unnatural . Mashing two words together or mixing up a bunch of letters to form a new word rarely appears or sounds smooth . Tame — Flat , Descriptive , Uninspired If you want your name to stand out in a sea of sameness and get noticed — without a massive advertising budget — you can’t afford to be shy . industry jargon — all of which sounds like a foreign language to outsiders . Don’t alienate potential customers . Is Your Name in Urban Dictionary ? If your brand is targeted at teens or young adults , be sure to look up your name in Urban Dictionary ( urbandictionary.com ) before you give it the green light . Avoid Acronyms Speaking of capital letters , FYI , people have ADD . You can expect them to remember only one name , not two . Two Pronunciations Is Double Trouble Words that can be pronounced two different ways are also pronunciation pitfalls . Silly Idea # 4 : Domain Name = Trademark Just because you own a domain name does not mean you own the trademark . Silly Idea # 5 : Don’t Look before You Leap Before you pounce on a domain name , make sure the words mashed together don’t spell something unintentional , which is called a SLURL — a clever portmanteau of Slur + URL . GOAL OF ASSIGNMENT What do you want to accomplish ? IN A NUTSHELL Sum it up it in 140 characters or less . BRAND POSITIONING How do you want your brand to be positioned in the marketplace ? CONSUMER INSIGHTS Consumer insights reveal people’s behaviors , as opposed to preferences . For instance , when naming an herbal tea brand , it helps to think beyond what tea drinkers like about herbal tea ( e.g . , flavor , fragrance , health benefits ) and consider what circumstances lead them to enjoy their tea . It could be getting home after a long commute , relaxing with a book in their favorite chair , or sipping a cup before bedtime to help them get a restful sleep . TARGET AUDIENCE Who are the customers you want to reach ? COMPETITION List your competitors so you know what you are up against and to help you steer clear of similar names , which could pose trademark conflicts . WORDS TO EXPLORE List some words you may like to have in your new name . List any words you would not like to have in your new name . NAME STYLE LIKES & DISLIKES List 5 brand names that you collectively like the style of ( and why ) . ACID TEST FOR USING THE NEW NAME Write how the new name would be used in a sentence . ALSO GOOD TO KNOW List anything else you think would be important to the name development . Open the Thesaurus Treasure Chest Begin your online brainstorming on a thesaurus website , where you can find a jackpot of synonyms and related words . Supercharge Your Imagination with Images A picture says a thousand words . And many of those words can inspire awesome names , which is why I always do image searches to fuel my creativity . Comb through Glossaries of Terms Every sport has its own lingo of fun words and phrases . You can find pages and pages of them online by searching for “ glossaries , ” “ lingo , ” “ vernacular , ” “ jargon , ” “ dictionaries , ” “ thesaurus , ” “ terms , ” “ words , ” or “ slang , ” which are essentially the same thing but will turn up different results in searches . 12 Rules for Reviewing Your Names Rule 1 Have people initially review the list of names independently , as opposed to in a group . Is it right ? which is much more objective and effective . Rule 3 Refrain from negative comments . print out the list to review on paper instead of viewing it online . Read it multiple times , top to bottom and bottom to top . Give yourself a few days to let all the names sink in . Rule 6 As tempting as it is , do not share your list with outsiders and ask for their opinions on SurveyMonkey . A good way to review company names is to imagine each one on your caller ID , name badge , store sign , website , or business card . Imagine product names on the product , a sales sheet , or on the shelf . Rule 8 Don’t be afraid to be different . Rule 9 Refrain from looking up domain names this early in the process . Rule 10 Each reviewer should select at least ten names from the list . Rule 11 Don’t fall in love with any one name until after you have conducted trademark screens . Rule 12 Have fun !